SoCal Race Shop Custom Auto Racing 2-Layer. All new for 2012, the latest addition to our ever-expanding line of Nomex auto racing suits is the SFI 15 Nomex® Auto Racing Suit (our 1-piece suit is popular for road racing applications. )This suit is an SFI 3.2A/15-rated design which uses Dupont Nomex throughout for the best in protection. Drivers needing the most protection possible can rest assured that our suit is designed and built with their needs in mind. If you are in the market for a safe, comfortable, competitively priced, high-quality fire suit, we are confident that you will not be disappointed in our new 2012 Nomex racing suit. Safety – Our Nomex racing suit exceeds the TPP rating for SFI 3.2A/15 needs and can be relied upon to provide maximum protection in the event of an accident. With a six-layer Nomex construction, the suit provides superb resistance to fire and heat. Hopefully you'll never be put into a situation where you need to test the suit's capabilities for real, but if you should, you can trust the suit to perform brilliantly. A fire suit should be comfortable too, however, as you must not have any distractions that detract from your ability to focus once you hit the track – this includes your racing suit. Comfort – This suit features elastic cuffs, elastic under arms for 360 degrees of movement on both the suit and the jacket, an adjustable belt (suit only), elastic waist (pants only), and a smooth tapered collar on the suit and jacket for added comfort. Once you try on your K1 Nomex racing suit, you'll know that you have made the right choice. This suit is the absolute best for all drivers needing this level of protection. 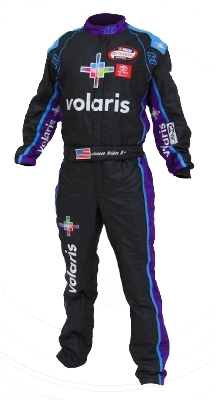 We make each and every one of our Nomex racing suits to order. We do not carry this item in stock as we strongly feel that a fire suit should be tailored to each customer's exact size and specifications. If you are interested in our SFI15 Nomex fire suit, please note that it may take up to 3 or 5 weeks for your suit order to be completed. Constructed from six individual layers of Dupont Nomex fire-resistant fabric to the latest SFI specifications, we feel that the wait is worth it to ensure a product of the highest quality. If you compete in auto racing, drag racing, sprint car racing, or another type of motorsport that requires use of a Nomex fire suit, we encourage you to contact our team today to learn more about how we can customize a auto racing suit around your needs.